Oil Prices: Is a "V-Shaped" Recovery on the Horizon? Oil-field service company Core Labs offers a very bullish take on the oil market. The price of crude oil has been battered for more than a year due to a vastly oversupplied oil market. However, that market is showing signs of improving and could be poised for a big second-half rebound. That's the bullish take recently offered by Core Labs (NYSE: CLB), which detailed its outlook for the oil market when it reported its first-quarter results. Here's why Core Labs is confident that the worst is almost over the for oil market. The Company continues to anticipate a "V-shaped" worldwide commodity recovery in 2016, with upticks expected to start in the third quarter. Global demand for hydrocarbon-based energy continues to improve, while worldwide crude oil supply peaked in the second half of 2015 beginning a decline that Core believes will continue through all of 2016 and 2017. Core Labs notes that not only is demand for oil improving, but supplies clearly have peaked and are now in decline. In terms of demand, the International Energy Agency (IEA) noted in its most recent oil market report that global oil demand grew by a pace of 1.8 million barrels per day last year and its expected to grow by a pace of 1.2 million barrels per day in 2016. While the rate of growth is slowing, demand is still growing. Meanwhile, supplies have clearly peaked and have started to decline with the IEA reporting a 300,000-barrel decline in March as the steep drop in investments by oil companies takes hold. Oil companies have cut deeply into their capex budgets with Anadarko Petroleum (NYSE: APC), for example, cutting its investment spending by 50% over last year's level. That deep spending cut will have a noticeable impact on Anadarko Petroleum's oil production, which is expected to fall from an average of 312,000 barrels per day in 2015 to as low as 308,000 barrels per day in 2016. The Company has observed that U.S. onshore oil production peaked in March 2015 and has fallen since then by over 600,000 barrels of oil per day ("BOPD"), some of which was offset by new additions to production in the Gulf of Mexico ("GOM") as a result of eight deepwater legacy-field developments coming on-line in 2015. This new production, from deepwater fields that includes Anadarko's Lucius and Heidelberg and Shell's (NYSE: RDS-A) (NYSE: RDS-B) Stones, offset significant declines in existing GOM fields. At current U.S. activity levels, Core predicts 2016 U.S. onshore oil production will fall approximately 1,100,000 BOPD, somewhat offset by GOM gains of approximately 200,000 BOPD, yielding a U.S. net decline of 900,000 BOPD and net decline curve rate of 10.1%. Based on currently available worldwide crude oil production data, coupled with internal Core Lab data, Core has increased its estimate of the net worldwide annual crude oil production decline rate to 3.3%, as supported by recent IEA reports that worldwide crude oil production fell 300,000 BOPD in March from February 2016 levels. March was the third consecutive month of global oil production decreases. Driving this steep U.S. production decline are shale-focused producers with Continental Resources (NYSE: CLR), for example, expecting its average daily production to decline by 10%, while its exit-to-exit production rate will decline by nearly 18%. 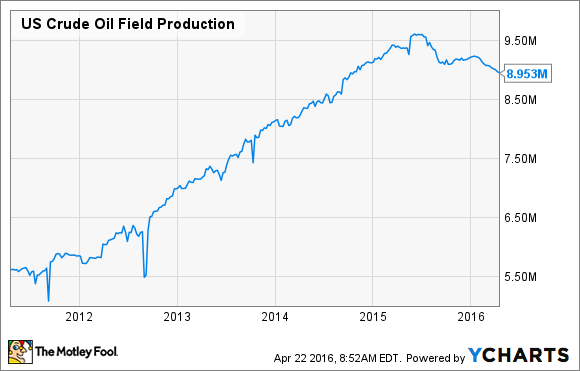 That's a significant shift for Continental Resources, which grew its production 27% last year. Its decline is so steep because unlike Anadarko Petroleum or Shell, it won't be seeing the benefit from legacy investments made in longer-cycle offshore projects in the Gulf of Mexico coming online this year. Instead, horizontal wells, like the ones Continental Resources develops, rapidly decline, thus requiring the company to continually invest in new wells just to keep up. Given where the oil price is right now, it can no longer afford keep up, let alone grow. The increase in the net worldwide decline rate is predicated on sharper decline curve rates for tight-oil reservoirs and the significant decline in maintenance capital expenditures for the existing crude oil production base. This, coupled with the continuing decline in global production and the continuing increase in global energy consumption, should create a tight crude oil supply market for the second half of 2016, and that should lead to increased crude prices and industry activity levels worldwide. In other words, supplies are coming down quicker than anticipated, while demand growth remains in tact. That should lead to a much tighter oil market later this year, fueling a much improved oil price. This would give companies like Continental Resources the cash needed to start drilling more wells to begin offsetting production declines, thus improving industry activity levels. If everything plays out the way Core Labs expects, the oil market could be on the upswing as early as next quarter. That being said, the oil market has a tendency to not always follow expectations, especially if something unexpected enters the mix like even more oil production from OPEC or a global recession leading to weaker-than-expected demand. Bottom line: Don't take the forecast to the bank just yet, but don't dismiss it entirely, either.